The beautiful, strong and secure door that is 25% more thermally efficient than the competition ! 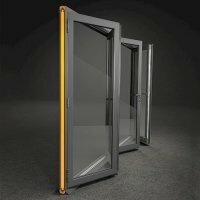 Robustly designed to take the weight of triple glazed panes as standard. Choose this option on your Bi-folds for the best thermal performing doors currently available on the market. High performance,easy clean glass Celsius Clear insulated glass is available as an optional upgrade on WarmCore folding sliding doors. This unique high performance glass utilises a Low-E and solar control coating, with an Argon filled cavity, to limit the amount of UV and heat that passes through the glazed unit, giving the ultimate in thermal control, whatever the weather. 24/7 help when you need it. The ERA Five Star Guarantee gives access to a FREE call out service so you have the reassurance of knowing that, in the unlikely event of a forced entry, a trained professional will come to secure your property. ERA are so confident in the quality, reliability and security of the WarmCore door, they will even pay the excess on any home insurance claim due to the failure of an approved component- so you can be rest assured that you’re covered. WarmCore has been designed from the ground up to offer market-leading thermal performance, and comfo..